A Tribes Army was formed in Syria in order to liberate regions east of the Euphrates occupied by the terrorist Kurdistan Workers’ Party (PKK)’s Syrian affiliate, the PYD. The 5,000 strong army, which is called Jaysh Al-Ashayer in Arabic, will launch an official ‘war of liberation’ following a meeting that is slated to be held by the end of January. The army is shortly set to attract massive support from various tribes as it is expected to quickly expand its numbers. Meanwhile, Syria’s tribes founded commissions documenting the ethnic cleansing being carried out by the U.S. and PKK terrorists in regions under their occupation. Syrian activists have called on shopkeepers in Syria's northern Manbij city to close down businesses on Sunday in protest of the killing of two civilians by the PKK/PYD terrorist organization.Hundreds protested against the PKK/PYD group on Friday following the discovery of the bodies of Hannan al-Jarivah, 25, and Abbud al-Minkhan, 23, after -- the demonstrators believe -- they were tortured to death by PKK/PYD militants.The bodies of the two young men, with one’s head cut off, were found in a village some 20 kilometers (12 miles) east of Manbij.Video: Hundreds protest against violence of PYD/PKK in Manbij, SyriaTension escalated into a gun battle between the PKK/PYD terrorists and angry civilians after families of the two victims recognized their bodies after activists shared their photos on social media.Turkish military convoy dispatched to Syrian borderErdoğan urges PKK/PYD terrorists in Afrin to surrenderIn a statement, the High Council of Syrian Tribes condemned the killings, saying that crimes committed by PKK/PYD terror group in the region “were not new”.It went on to call on people of the city to “rise up” against the terrorist group.In November, business owner in Manbij staged a general strike to protest the forcible recruitments of young people by PKK/PYD.An Arab-populated city located on the west bank of the Euphrates river, Manbij remains under the control of the PYD, the Syrian offshoot of the PKK terrorist group, which has waged war against Turkey for more than 30 years.The PKK -- listed as a terrorist organization by the U.S. and EU as well as Turkey -- resumed its armed campaign in July 2015. Since then, it has killed more than 1,200 Turkish security personnel and civilians, including women and children. Acting in coordination with Turkey, the tribes launched the first wave of resistance in Manbij yesterday, following a meeting with the city’s tribal in Idlib that resulted in several accords, which culminated in popular protests in Manbij condemning PKK terrorists and the U.S. Under pressure from popular protests, U.S. soldiers were forced to evacuate their bases and escape outside the city. 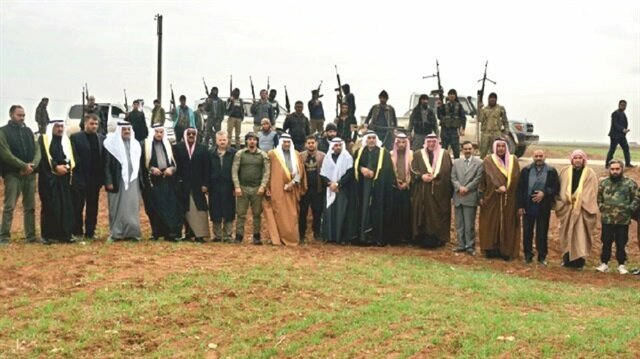 Some Kurdish tribes were also part of the accord reached in Idlib that vowed to keep fighting under the city is cleared from PKK/PYD terrorists, according to the head of the Supreme Tribes Council and Suhaayitat Tribe leader Sheikh Raif Abu Okle al-Rajaw. In November, business owner in Manbij staged a general strike to protest the forcible recruitments of young people by PKK/PYD. An Arab-populated city located on the west bank of the Euphrates river, Manbij remains under the control of the PYD, the Syrian offshoot of the PKK terrorist group, which has waged war against Turkey for more than 30 years. The PKK -- listed as a terrorist organization by the U.S. and EU as well as Turkey -- resumed its armed campaign in July 2015. Since then, it has killed more than 1,200 Turkish security personnel and civilians, including women and children. Syrian tribes also reject U.S. attempts aiming to sway the Arabs of Raqqa by promising Saudi funds that will allegedly by funneled to finance the rebuilding of the city’s infrastructure. The tribes stressed that before any investment of this kind can take place, the PKK/PYD occupation must be eradicated.